DALLAS — Warp-drive technology, a form of "faster than light" travel popularized by TV's "Star Trek," could be bolstered by the physics of quantum thrusters — another science-fiction idea made plausible by modern science. NASA scientists are performing experiments that could help make warp drive a possibility sometime in the future from a lab built for the Apollo program at NASA's Johnson Space Center in Houston. "We're looking for a change in path length of the photon on the interferometer, because that would be potential evidence that we're generating the effect we're looking for," White told SPACE.com. "We've seen, in a couple different experiments with several different analytic techniques, a change in optical-path length. We're making one leg of the interferometer seem a little shorter because of this device being on, versus the device being off. That doesn't mean that it's what we're looking for." While these results are intriguing, they are in no way definitive proof that warp drive could work, White said. The scaled-down experiments are just a first step toward understanding if these concepts can be taken out of the realm of theory and applied practically. Quantum-thruster physics, another technology White is looking into at NASA, could be the key to creating the fuel needed for a warp drive. These electric "q-thrusters" work as a submarine does underwater, except they're in the vacuum of space, White told the crowd here at Starship Congress on Aug. 17. The spacecraft is theoretically propelled through space by stirring up the cosmic soup, causing quantum-level perturbations. The resulting thrust is similar to that created by a submersible moving through water. The technology produces negative vacuum energy, a key ingredient for an exotic-matter-powered warp-drive engine. 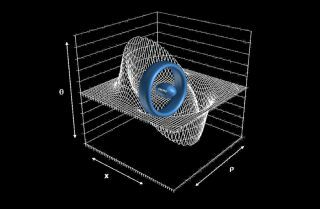 "The physics models that tell us how to construct a q-thruster are the same models we'll use to generate, design and build a negative vacuum generator," White said. "The quantum thrusters might be a propulsion manifestation of the physics, like the big ring around the spacecraft. If you looked in there, there might be 10,000 of these little cans that are the negative vacuum generators." White wants to try to apply the quantum-thruster physics models the researchers have been working with in the lab to their work with warp drive. "We have measured a force in several test devices which is a consequence of perturbing the state of the quantum vacuum," White said. The effect has been small but significant in his experimentation. Going forward, White hopes to do more robust testing to possibly magnify those claims. The warp-drive ship itself would never be going faster than the speed of light, but the warped space-time around it could help the spacecraft achieve an effective speed of 10 times the speed of light within the confines of White's concept. When first proposed by Mexican physicist Miguel Alcubierre in 1994, the warp drive would have required huge, unreasonable amounts of energy, but White's work brought those numbers down. Previous studies extrapolated that the drive would need energy equal to the mass energy of Jupiter. "In the early epoch of the universe, there was a very short period known as inflation," said Richard Obousy, president of Icarus Interstellar. "We believe that during that inflationary period, space-time itself expanded at many times the speed of light, so there are tantalizing questions when you look at nature as a teacher. Is this something that can be duplicated around the vicinity of a spacecraft?" Now, White thinks the drive could be powered by a collection of exotic mass about the size of NASA's Voyager 1 probe if the rings housing the mass were shaped like a donut and oscillate over time.